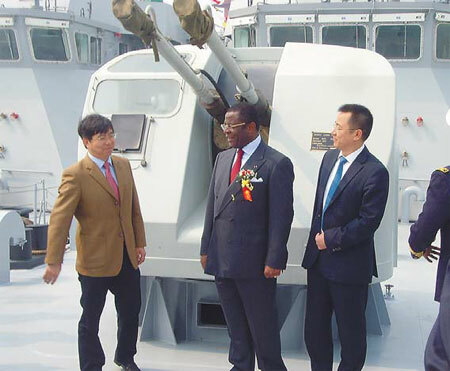 During the visit of Defence Minister Mebe Ngo’o to China in April, 2014, he visited Qingdao, where he received two new patrol ships at Qingdao shipyard. 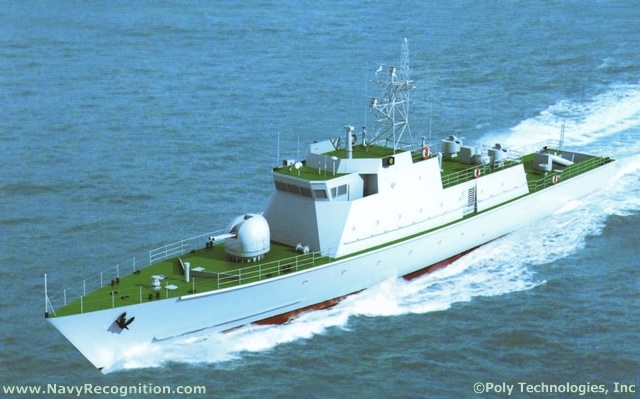 Both P109 and P108 patrol craft were inducted into the Cameroonian naval fleet. The two patrol ships subsequently arrived at the Cameroonian port of Douala, that country’s economic capital, in May 2014. Additionally and following quite swiftly on the heels of a 2013 contract for the delivery of an unspecified number of Mi-17 helicopters signed with ROSOBORONEXPORT, a photo of the Cameroon Armed Forces Chief, Lt Gen Meka Rene Claude and other senior officers taken whilst on an operational tour of the Far North, clearly shows a Mi-17 in typical Cameroon Air Force livery and with a roundel visible. So the Cameroon Air Force have operationalized the Mi-17 helicopter. It is really good to have you back, I believe we kept up the good work and kept up the gold standard. Derail thread of the day yesterday the AIRCHIEF talked about a change in the focus and mission statement of the AIRFORCE it is extremely important that Nigeria acquire a troop carrier like the MI-17. Sir,it has been a while since I got a post from the blog. Hope all is well. Big welcome back oga Beegeagle…..and compliments of the festive season to you sir. Why is Cameroon trying to buy what Nigeria buys? Na competition? You can see the comparatively low bridges which indicates that they are small ships. The bridge of a big ship cannot be at eye level viewed from in front of the main guns. I mean, the bridge barely rises higher than the gun. That said, the ships are armed with twin 37mm cannons though. Good one for the neighbours if it serves their purpose. Begging your indulgence OGA BEEGS Merry Xmas to you Please is it possible to Release a thread on the Nigerian Army . I want to make a comment on the recent Acquisition of the T-72 TANKS and the BMP-2. Thank you in Advance and may all your dreams come true. If we and our ‘cunning-crafty-envious’ neighbours are driving the same okada about town, we won’t know who is king of the road. That erroneous impression stemmed from some misjudgement on our part. The truth is, even from here, you can tell that it is the same haul of Poly Technologies ships. Taking a closer look, you can even see the outline of two sheathed twin 37mm cannons. These are the only ships that the Chinese have built for the Cameroonians. There is nothing else under construction in China for Cameroon at this time. Compliment of the season ooo. Oga beegs welcome. Our days have been incomplete without the daily visit to this site. Compliments of this happy season!! An interesting analysis which comes to the same conclusion we have reached on this blog :The NA is in too much of a defensive posture. To the humans who up until recently vehemently advocated for war against Cameroon on the premise of their support for bokoarerams, i hope we can all see how calm and level Nigerian heads have prevailed, hereby preventing us from taking a ratchet and regrettable step. Now, another neighboring, derelict, gestapo regime seems to be the obvious culprit, i’m sure if we probe deeper, we’ll clearly see the hands that control the puppet regime. This war can’t be fought and won on lethargic, emotional irrationalities, but by steady and concise nerves, yes, war of attrition comes to mind, but, we have no choice than to wall/fence/secure our borders, India, Israel, Turkey, Iran, America, South Africa, even with all relevant manpower and equipment understand this simple logic. #VIctoryForNigeria. Oga Beegeagle, I respect your hustle sir. Akwaaba. Welcome back Beegs. Nice to know you are in good spirits. Morale still high! Compliment of the season Oga Beegs. You’ve been missed! Great to have you back Oga Beegs. So happy to see you updates again General. Hi my old friend General Beeg!! I found out you’re back through Armyrecognition.com! Happy New Year to all of Beegeagle Blog readers!